Canva is foremost an online graphic design platform. It offers free access to a wide assortment of design tools and options, as well as premium options for paying customers. When Canva first came on the scene it garnered use from students and amateur graphic artists seeking a quick way to design presentations, brochures, posters and the like. More and more users, both professional and non-professional are gravitating towards this mostly free service. But Canva offers more in the way of getting you to down-and-dirty, clean and simple, colorful and dynamic design. Canva has a Design School with hundreds of tutorials on everything from fonts to formatting. They also have a blog with great tips and topics about all things trending in Graphic Design. I recently reposted this January article in NBR Design Studio’s Facebook page . 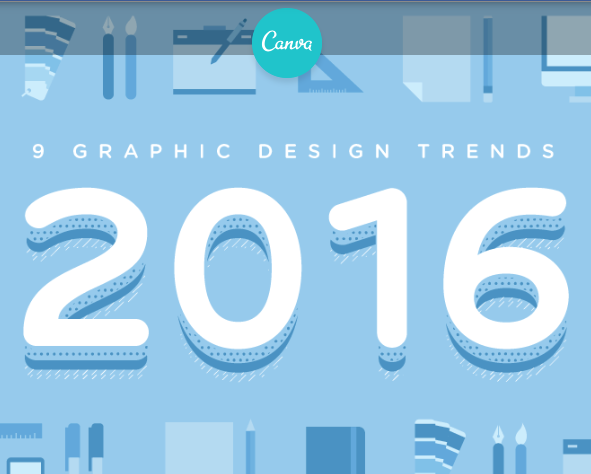 It was written by Canva’s Janie Klever and it is a clever look at what’s trending right now in Graphic Design.